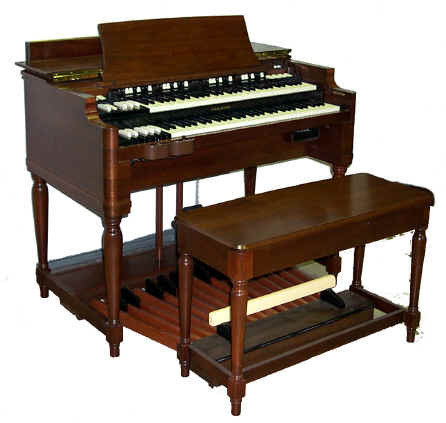 The birth of the "New B-3"
Since its introduction in 1955, the Hammond B-3 has become the essential performance tool for the worlds great keyboard players. The instantly recognisable B-3 sound is synonymous with the world of popular music, while no concert stage would seem complete without a B-3´s imposing wooden cabinet. Now, for the first time Hammond have exactly replicated the original B-3 design specifications with the introduction of the New B-3. The unique B-3 sound is reproduced by a revolutionary newly designed sound generator system (96DigitalToneWheels™), which recreates all of those wonderful idiosyncrasies of the Tone wheel generator which have eluded all previous digital systems. Almost all comtemporary electronic musical instruments generate their sound "on the fly" : this means that wheneven a note is pressed, the computer figures out which key and sound-characteristics are needed and fetches this information out of a sample-table from the computers memory-banks. This information is then processed to produce the actual sound. All of this happens within milli-seconds after any key is pressed. It all has to do with "continuous tone-generation "
Another aspect is the polyphony : over are the days of 16, 32, 64, 128-note polyphonie... over are the days of "note out-phasing"... every single drawbar-note is there... all the time... that's what we call " all-note generation". Two, 61 note, B-3 style, waterfall key, keyboards allow for the essential performance characteristics of the Hammond masters, especially effortless palm glissandos. While four complete sets of nine traditional harmonic drawbars and twenty four reverse colour key presets achieve total ease of set up. It is by utilising several tone varying features that the B-3 performs so uniquely. Upper and lower pitch foldback subtly effects the overall sound, while, probably, the most important and interesting feature is the nine key contact system operating on each key. These contacts connect from each of the nine drawbar pitches and by pressing a key slowly each pitch level can be determined, high to low. This system created the earliest form of touch response for tone variance as well as expression. This mechanical contact system is also responsible for Hammond´s famous key click noise, an unintended feature that became an essential component of the B-3 character. The new B-3 incorporates a complete mechanical contact system, totally unique in a modern instrument. Sound dynamics are controlled by an exact copy of the original B-3 expression curve incorporated in the new instruments foot volume controller.